relations school in the US, there is such poor understanding of other immigrant-culture countries where immigrants can meet – and have met – just as much success as they do in the US; namely: Canada, Australia, New Zealand, and increasingly most of Western Europe; and even these few examples are narrowly cherry-picked. Now, I could just leave the story here as a self-indulgent vignette of kneejerk outrage combined with a little mockery, but the subject is serious enough to warrant genuine consideration. The nub of the issue is not really that other countries can be successful, or that the United States has a tendency for an overweening pride that persistently rankles the rest of the world. The real issue is that the image of the US being the best place to pursue one’s dreams – specifically, the ‘American Dream’ – and the US being a place where anyone can make it if only they work hard and smart enough, is just simply no longer true. This is my key point: social mobility in the United States has been on the sharp decline for a generation and is now worse than almost everywhere else in the developed world. Take note: social mobility – the ability to move between the rungs on the income ladder – is decreasing. 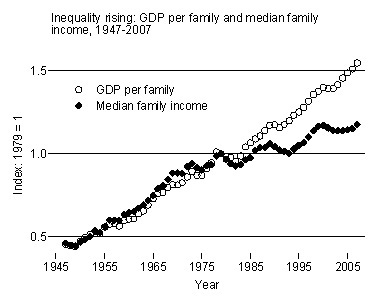 It is not just an issue of income inequality, although that of course is increasing rapidly at the same time. But don’t just take my carefully selected quotes as evidence; you can see the graph from the OECD that helps to illustrate the point. The height of each bar measures the extent to which sons’ earnings reflect their fathers’ – essentially, the intergenerational persistence of inequality. But if social mobility statistics from the OECD do not convince you, take a look at how median wages diverged from GDP per capita since Reagan came to office. We see increasing expressions of frustration with this entrenched immobility and inequality in American society. The most recent obvious iteration of this was the Occupy Movement, even if it was incoherent in its aims and easy for many to dismiss as a bunch of jobless socialists. Regardless, reality has yet to fully catch up with rhetoric, with presidents and presidential candidates alike still peppering their speeches with talks of the American Dream. They’re dreaming alright! So, to return to that seemingly innocuous tweet: hopefully such unsubstantiated and arrogant triumphalism was just a slip made by one individual rather than ignorance being endemic throughout the institution of SAIS. As much as I am loving my time here in the United States, the future does not bode well for the vast majority of Americans who, unlike us, will not have graduate degrees from a top university in the country. As an analyst from the conservative American think tank, the Heritage Foundation, so aptly put it: “If America is so poor in economic mobility, maybe someone should tell all these people who still want to come to the US.” The analyst was trying to be ironic, but maybe someone should.